A RIP-ROARING ROMP through Georgian and Victorian England as William Thompson – better known as Bendigo – fights his way from the poverty of a Nottingham slum to fame and fortune as champion bare-fist boxer of all England. 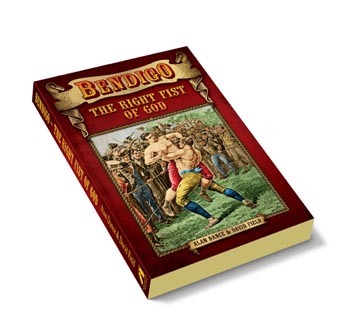 His fists were as quick as his wits and as ready as his humour, and with twenty prizefights to his name Bendigo became the most famous son of Nottingham since Robin Hood first ventured from the leafy glades of Sherwood Forest to taunt the Sheriff. Later, sinking into a wretched haze of drunkenness and with numerous spells in the House of Correction, Bendigo was finally saved from an ignominious end when a chance encounter with an evangelical preacher turned his life around. Abandoning the evils of strong drink he took to preaching the word of God, once again fighting the good fight, but this time from the pulpit rather than in the ring. A legend was born, and when he eventually died aged nearly seventy, thousands followed his coffin the five miles to the burial ground.